My watch can’t read my pulse. Sometimes the heart rate sensor on your watch may not be able to find your pulse. This can be fixed by adjusting where you wear the watch on your wrist. If the watch is too close to your hand, your wrist bone can lift the back of the watch away from your skin. Try sliding the watch up your arm a bit (toward your forearm) so the back of the watch is flush against your skin. Tighten the watch so it fits snugly on your wrist. Excessive perspiration can also prevent a good reading. Dry your arm and try again. My watch doesn’t turn on. Should I wear my watch while I’m sleeping? We recommend you wear the watch during the day and charge it at night while you sleep. That way, your watch will be fully charged to record your activity during the day. Can I get the watch wet? The watch isn’t waterproof, so don’t swim, shower or bathe with it. However, it’s water-resistant, so a sprinkle here or there (e.g. raindrops) is OK. Just wipe it dry with a clean cloth. Why do I sometimes see a really high heart rate on my watch even though I don’t feel like I’m working that hard? The heart rate sensor on your watch may not be reading your pulse correctly. This can be fixed by adjusting where you wear the watch on your wrist. If the watch is too close to your hand, your wrist bone can lift the back of the watch away from your skin. Try sliding the watch up your arm a bit (toward your forearm) so the back of the watch is flush against your skin. Tighten the watch so it fits snugly on your wrist. Excessive perspiration can also prevent a good reading. Dry your arm and try again. Tip: You can always measure your pulse manually. What is power saving mode? The watch will request to enter power saving mode when the battery is less than 15%. Once the watch is in power saving mode, you will be unable to start an exercise. 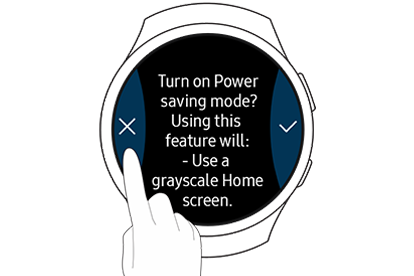 In order to prevent the watch from entering power saving mode, tap the X option when prompted as shown below. How do I exit power saving mode? 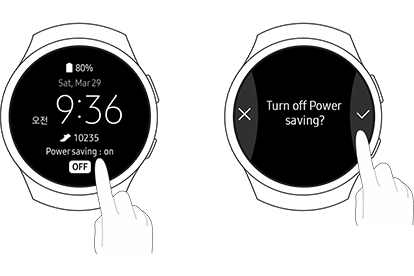 If your watch goes into power saving mode, a different watch face will be displayed indicating ‘Power saving: on’. You can always exit power saving mode by tapping the “OFF” button on the bottom of the screen and by tapping the √ option to confirm your selection. This will restore the HeartWise watchface and allow you to begin an exercise. How do I review past data on my phone? In the phone app, tap the “Date” icon just to the left of your exercise circle. (If you don’t see it, make sure you’re on the Day tab.) On the calendar page, select the day you want to review and tap OK. To see your data from the current week, tap the Week tab. How do I add exercises manually to my phone? If you exercise without wearing the watch (e.g. water-based exercises or activities with vigorous arm movements), you can add the exercise to the phone app manually. Just go to your main screen, tap the blue “+” button in the lower right corner, then tap “Exercise” icon. You can add the start time, day, duration, peak heart rate, activity type, RPE, and symptoms. Tip: To find your peak heart rate when you’re not wearing your watch, measure your pulse manually. If I miss a day, can I go back and add health data and answer surveys for that day? You can add and change health data and answer surveys for the past 2 days. You can’t add data or update information that was entered before then. © 2018 Samsung Electronics America, Inc. All rights reserved. Samsung is a registered trademark ofSamsung Electronics Co., Ltd. All products, logos and brand names are trademarks or registered trademarks of their respective companies. Screen images simulated.